We threw out the tour playbook and created a completely unique offer for our most valued family customers. This private charter includes your own private boat with captain and crew exclusively for you and your family for up to 12 family members for a great price. Larger parties, please call (808) 345-2547. The family enjoys half the time to fishing! Land a Marlin or native game fish Ono or Mahi Mahi. The second half of the time is a custom tour! Depending on marine life activity, you can go whale watching, see spinner dolphins, or enjoy snorkeling in the pristine waters off the Kona Coast of Big Island. Only Manta Adventures offers this fantastic tour combination. 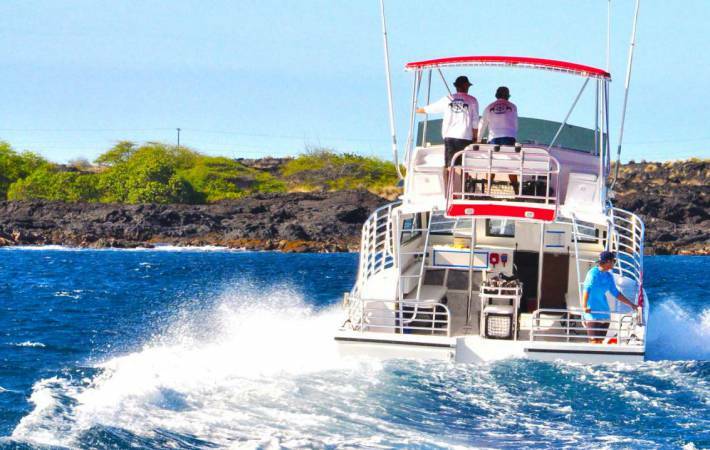 The private charter Family Fish and Snorkel tour will give you an incredible experience on your vacation to Kona. Kona, Big Island Hawaii is a top fishing destination! With deep ocean close to shore and protected coastal waters, conditions are great for catching fish! 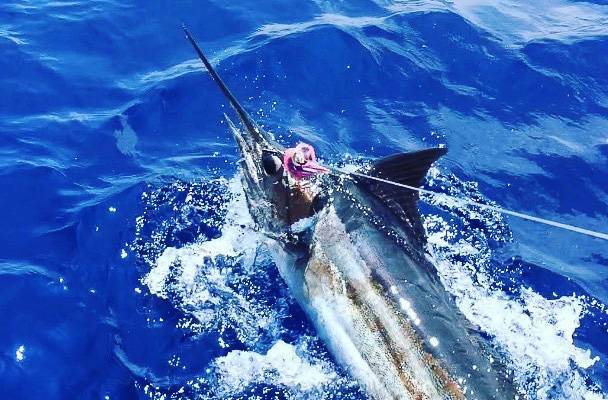 Hawaii deep blue waters have marlin, spearfish, ahi tuna, mahi mahi, and ono (wahoo). We provide all of the tackle and expertise to make your fishing trip fun and bountiful. Bring the kids, make it a day and everyone will enjoy fishin’ in Hawaii. The second part of the charter is up to you and wildlife. Nov. – April is whale season, so we can watch whales. Hawaiian spinner dolphins reside along the Kona Coast and it’s always fun watching them jump and play. There’s time to find a good snorkel spot and discover the underwater world. Kona reefs are full of colorful and interesting reef fish, interesting coral formations and sea turtles. You decide, we’ll make it happen. Please bring lunch or any snacks and drinks.